The boy wonder Rory McIlroy will return this week to defend his PGA title after missing just a month out with a ‘total rupture’ of ankle ligaments while playing football. McIlroy missed his Open Championship defence at St Andrews and was also expected to be forced out of a return to Whistling Straits. But he will tee it up, and still as the World No 1. Throughout last week the Northern Irishman hinted through his Twitter and Instagram accounts that he was on the verge of a return. First a video of a work-out, then pictures of a bruised ankle, then a video of him hitting the driver before the inside of a plane with emojis of an American flag, a thumbs up and a golf flag. And he confirmed his place in the field when he retweeted the PGA of America’s tee time which will see him line up with Jordan Spieth and Zach Johnson, the Major winners from 2015. The trio have won the game’s last five Majors. 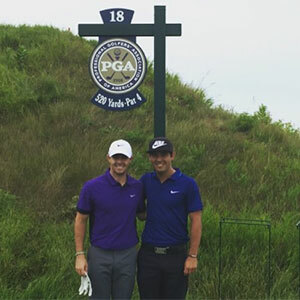 The last time McIlroy was at Whistling Straits, prior to his practice round on Saturday, he tied for third at the 2010 PGA, one stroke out of the play-off which was won by Martin Kaymer.